The Sixth Edition of "Physics for Scientists and Engineers "offers a completely integrated text and media solution that will help students learn most effectively and will enable professors to customize their classrooms so that they teach most efficiently. The text includes a new strategic problem-solving approach, an integrated Math Tutorial, and new tools to improve conceptual understanding. 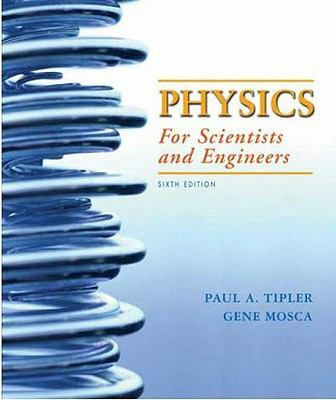 To simplify the review and use of the text, "Physics for Scientists and Engineers "is available in these versions: Volume 1 "Mechanics/Oscillations and Waves/Thermodynamics "(Chapters 1-20, R) 1-4292-0132-0Volume 2 "Electricity and Magnetism/Light "(Chapters 21-33) 1-4292-0133-9Volume 3 "Elementary Modern Physics "(Chapters 34-41) 1-4292-0134-7Standard Version (Chapters 1-33, R) 1-4292-0124-XExtended Version (Chapters 1-41, R) 0-7167-8964-7Tipler, Paul A. is the author of 'Physics For Scientists and Engineers chapters 1-20', published 2007 under ISBN 9781429201322 and ISBN 1429201320. Loading marketplace prices 37 copies from $24.90 How does the rental process work?